After the Civil War, Captain James Wilson White, Co. “H,” first Carolina Calvary, returned home in Fort Mill, South Carolina, to help run his father’s plantation. The main crop was cotton. In Alamance County, the textile industry was growing, creating a good market for cotton. Captain White decided to come to Alamance County to sell his cotton to the mills run by Edwin Michael Holt. 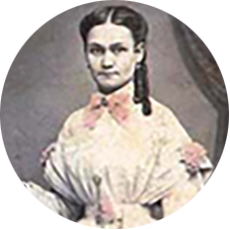 While in Alamance County, Captain White met and fell in love with E.M. Holt’s youngest daughter, Emma Virginia. The handsome couple married on April 26, 1871. E.M. Holt loved his daughters and didn’t want to see them move away from Alamance County. To keep them near home, he built each one a large house on property he owned on South Main Street in Graham. The house for Emma and Captain James White was completed in 1873. The style is Queen Anne Revival, though Victoria was Queen of England at the time. The house had the symmetry and practicality of an earlier period, having fewer decorations that characterized the architecture of the time. The White House originally had nine rooms plus large front and back halls and porches. Later, another room was added on the south side, along with a balcony. The house was of wooden frame and clapboard siding. Rising four feet above the ground level, the foundation was of brick covered with stucco. The roof was slate except for the addition, which was copper. Lighting in the house was originally by candles and lamps until the 1890’s, when the “Gaslight Era” arrived. Gas fixtures were added to each room. When electricity came to Graham in 1905, the house was wired. The wires were open to view and attached to ceramic insulators nailed to the walls. The controls were rotary or knife switches on the walls or by pull cords with switches at the base of the bare or shaded bulbs. Some of the original wiring can still be seen in the closets. When the house was renovated in 1927, the wiring was placed behind the walls. Heating went from fireplaces to burning wood, and later coal. In the early 20’s, “vapor heat” was installed. A coal-fired boiler that heated water at a reduced pressure produced this type of heat. Then the steam “vapor” was piped to the radiators in the rooms. In the 1930’s, an “Iron Fireman” was installed to alleviate the constant stoking and banking of the fire. Directly in the back of the main house, a small servant’s house was provided. 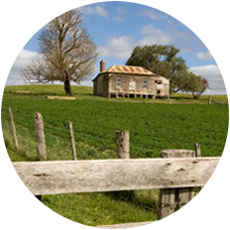 There were also two fenced-in barns and two tenant houses. Besides the servant’s house, the other outhouse was the schoolhouse. When the children grew up and went off to school, the building was used for storage. The schoolhouse was destroyed during a storm when an oak tree fell and crushed it. The floors were originally wide board pine planks; some of these still remain upstairs. In 1927, the house was remodeled and narrow hardwood flooring was laid on top of the pine. The hearths and fireplaces were made of imported tiles and the mantles were faux painted to look like marble. In the back of the house was an “L” shaped back porch. From here, doors opened to the kitchen, dining room and back hall, and later, the downstairs bathroom. A trap door on the floor led to a small basement. The McClures, later, included the porch into what is now the den. At some time, a one-story addition was added to the south side of the house, possibly in the 1880’s when Emily Farish Holt came to live with her daughter’s family. The new addition had a large bedroom, bath and closets, along with a separate chimney and fireplace built on the south side. As one enters the front door, the large front hall is just inside. Squared wooden arches open from the hall into the living room (left), the parlor (right), and the back hall (rear). In the past, these openings had been closed with heavy chaw drapes hung under cornices. The walls had been used to hang large family portraits, mirrors and game trophies. The ceilings vary from 10 to 14 feet high with the original plaster moldings around the light fixtures. The living room contained a built-in bookcase in one corner and a large, ornate, glass front bookcase in another corner. This bookcase was affectionately called “the thing.” By the built-in bookcase was the “Poppa Bear” chair reserved for the man of the house. The family clock, kept on the mantle, was wound each week just before Sunday school. While the living room served as the general living area, the parlor wasn’t used much. The parlor was more formal and contained items like their Steinway baby grand piano, a large gold-framed mirror, furniture and a red mahogany Victrola phonograph with gold leaf scrolls. The back hall had doors opening to the back porch, dining room, and the dressing room. The landing in the staircase was large enough to hold a grandfather clock and a spinning wheel. Beside the staircase was a chest for linen storage and a hat rack. A telephone table by the cove held the phone #514, in which the ring could be heard throughout the entire house. During the renovations of 1927, a switch was placed in the floor connected to a bell in the kitchen. The switch was pressed with the foot to summon people to the table. In the corner of the kitchen was a pantry where the icebox was kept, until the “real” refrigerator was installed. Originally, to cook food there was a fireplace in the kitchen. 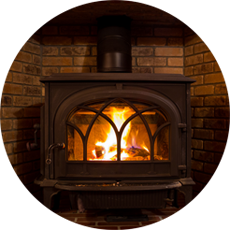 Then, a wood and/or coal burning stove was placed in front of the fireplace and vented through the flue. The range was a huge iron monster made by “Majestic.” In the early 1930’s, an electric stove was added. Now, the kitchen has been modernized with new cabinets, floor and up-to-date appliances. After World War II, Griffen and Elizabeth McClure who had lived across the street, acquired the property and moved into the White House. The garden land had been sold and two houses were built there. They made many changes to the house, such as closing the two south windows in the downstairs bedroom, incorporating the back porch into a small den, and replacing the double front door with a single door with a transom window above it. They demolished several of the outhouses, removed the concrete cap on the old well and filled it in. The kitchen was completely rebuilt and the fences and “rockery” were eliminated. The original color of the house was yellow with white trim, later to be painted white with dark green blinds. All windows were double-hung and rectangular except for the Gothic window in the front center. The original front door was double, with narrow beveled glass windows on each side. When the McClure family bought the house in the 1950’s, they changed it to a single door with an arched transom window above. The side windows remained the same. The McClures lived in the house until their deaths, where they raised their three children; Elizabeth, Martha and James. Both of their daughters, Mary Elizabeth McClure Phillips and Martha McClure Hathaway were married in the White House. After the deaths of Griffen and Elizabeth McClure, their daughter, Mary Elizabeth McClure Phillips, lived in the house until 1990, when it was sold to the town of Graham.